The Revolutionary War began in 1775, in response to British regulation of trade in the American colonies, taxation disputes, the lack of colonial representation in Parliament, the Boston Tea Party, and the retaliatory passing of the Intolerable Acts. Fighting broke out at the Battles of Lexington and Concord, and the Adirondack region would soon come to play an important role in the efforts of the Patriotic forces, containing both the location of "America's first victory" and the battles that are considered the "Turning Point of the American Revolution" in favor of the Continental Army. At the outbreak of the Revolutionary War, many Patriots realized that the poorly defended British Fort Ticonderoga was an easy target for American rebels to attack and would provide military supplies and armaments needed for the Boston area. Among those who saw the profit gained from taking Fort Ticonderoga were Colonel Benedict Arnold and the Green Mountain Boys led by Ethan Allen. Despite conflicts of leadership and authority between the two men, the American forces were easily able to seize the fort, stripping and looting it without any casualties on May 10, 1775. The nearby Fort Crown Point was captured shortly after. The capture of Fort Ticonderoga is considered "America's first victory" in the Revolutionary War and the supplies taken from the fort were integral in many other offensive and defensive maneuvers. Cannons and other equipment from the fort were transported to Boston to fortify Dorchester Heights and used to force the British to retreat, ending the Siege of Boston. The positioning of American forces at Fort Ticonderoga also hindered communication between the southern and northern units of the British army, and the fort served as the staging ground for the 1775 invasion of Quebec, as well as the location of the outfitting of the first American navy organized by Benedict Arnold. Accounts of the events surrounding the fort's seizure were highly disputed between Arnold and Allen, inciting a "war of the words" between the two as to who deserved credit for the capture. In 1777, British General John Burgoyne began the Saratoga Campaign in an attempt to gain control of the Hudson River Valley and split New England off from the other colonies. Burgoyne led a large army of British and German troops south from Canada, and by hauling a cannon up Mount Defiance, he forced the Americans to abandon both Fort Ticonderoga and Mount Independence between July 2 through July 6 of that year. The Saratoga Campaign involved an elaborate plan for the forces led by Burgoyne to be met in Albany by forces moving east through the Mohawk River led by Colonel Barry St. Leger and soldiers coming up the Hudson River led by General William Howe. However, Leger was forced to retreat and Howe sent his army to Philadelphia instead in an attempt to keep George Washington's focus off of trying to retake New York City from the British. Two months after the siege of Ticonderoga, Colonel John Brown captured British outposts surrounding Ticonderoga in a surprise raid that coincided with the first battle at Saratoga. On September 19, 1777 Burgoyne's army met the American forces in what is now Stillwater, where fierce fighting broke out without either side gaining a major advantage, as General Benedict Arnold had anticipated some of Burgoyne's movements. Awaiting reinforcements from New York City, Burgoyne's forces dug in to wait, but by mid-October they were growing short on time, supplies, and manpower. Attempts by British General Sir Henry Clinton to divert American attention were too little to help Burgoyne. A few weeks later on October 7, American forces pushed the British back and broke through the British defensive lines during which Benedict Arnold was seriously wounded in the leg. The British were forced to retreat north to the village of Saratoga where they were completely surrounded by the Americans within days. After a week of negotiations, Burgoyne surrendered to General Horatio Gates on October 17, 1777. The Battles of Saratoga are known as the "Turning Point of the American Revolution" because they demonstrated that the American troops could fight and defeat a European army, and the victory convinced the French to ally themselves with the Americans. After France declared war against England, the Spanish and Dutch followed suit and the British were forced into a world war spread across the globe. There's even more to learn about the American Revolution at the actual locations where the battles and sieges took place. 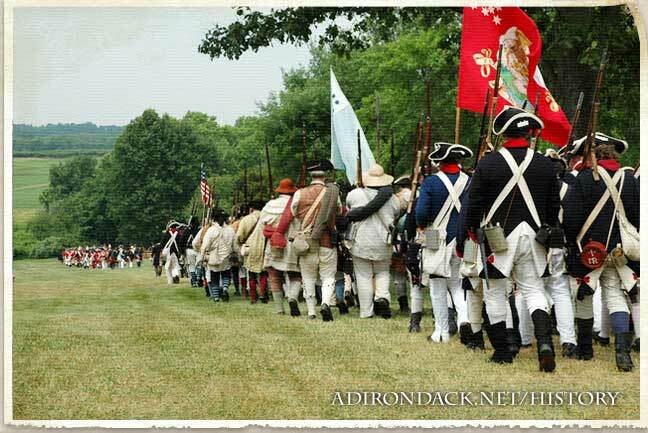 Explore the ruins, walk through the museums, and attend military encampments, demonstrations, and historic reenactments at Fort Ticonderoga and Fort Crown Point. Additionally, rent a bike and ride through the battleground or take a guided tour through the Saratoga National Historical Park.